Secret Weapons Over Normandy (XBOX) – This is actually the sequel to Lucas Arts Secret Weapons of the Luftwaffe which was really unique but somewhat obscure flight sim from late in the DOS era. It’s not an XBOX exclusive game, but its cheap and looks pretty cool, it also makes me want to pick up a copy of Secret Weapons of the Luftwaffe too. Superman: Man of Steel (XBOX) – This is an XBOX exclusive, and in a way reminds me of Superman 64 but done right. It looks like a lot of fun and despite being obscure is pretty well reviewed. 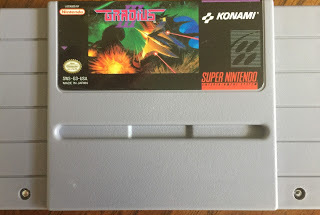 Darius Twin (SNES) – I’ve never played any of the Darius games before but they do seem to have a good following, and the franchise is pretty well known and up there with Raiden, and R-Type. Burning Soldier (3DO) – While stopping in to get the Wings of War resurfaced at my local retro video game store, I picked up a copy of Burning Soldier an odd space shooter of sorts for the 3DO. 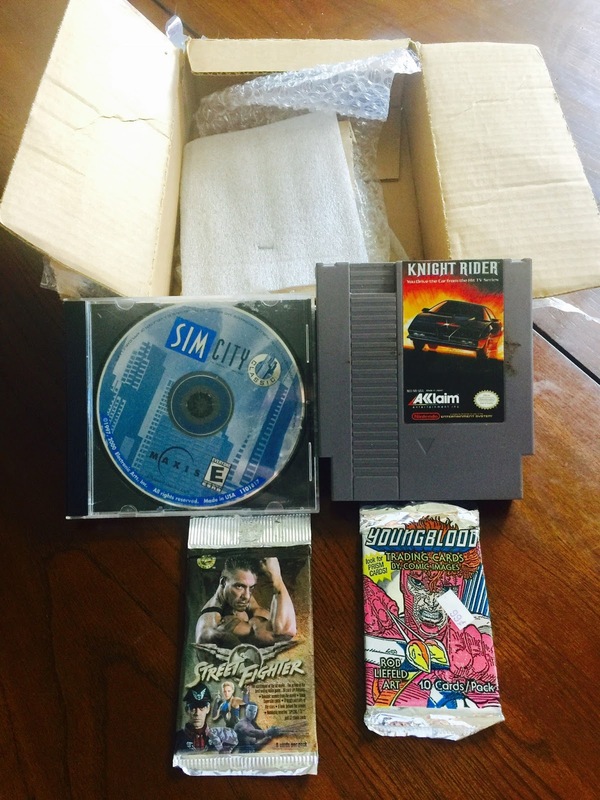 I was fan of the month for The Retro League in August and actually received the prize package on Tuesday. With two packages of collectors cards I also received, Knight Rider (NES), and SimCity (PC-DOS). I look forward to putting some play time in on both these soon. 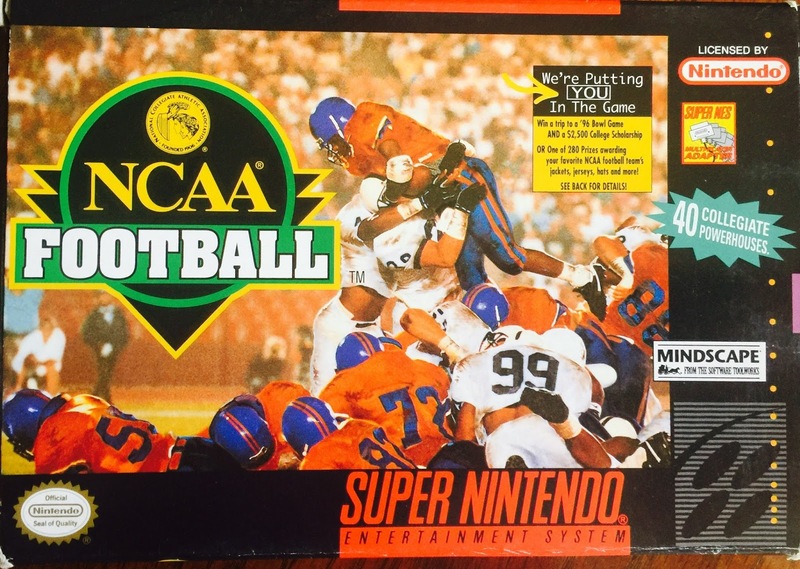 NCAA Football (SNES) – This is really a very good looking game but it’s controls are far from intuitive. I guess before I play it again I better check the manual since this one was a CIB buy. Overall it looks like a lot of fun especially as one of the first NCAA Football entries into video games. Although, you can only select from 40 teams, the list is still pretty impressive (no NIU Huskies though) and I chose Texas A&M versus Stanford, Aggies vs Cardinals. Interestingly they also had the Texas Tech Red Riders on the list too, which I didn’t expect with them not being all that well known of a team, but they are one of my personal favorites. 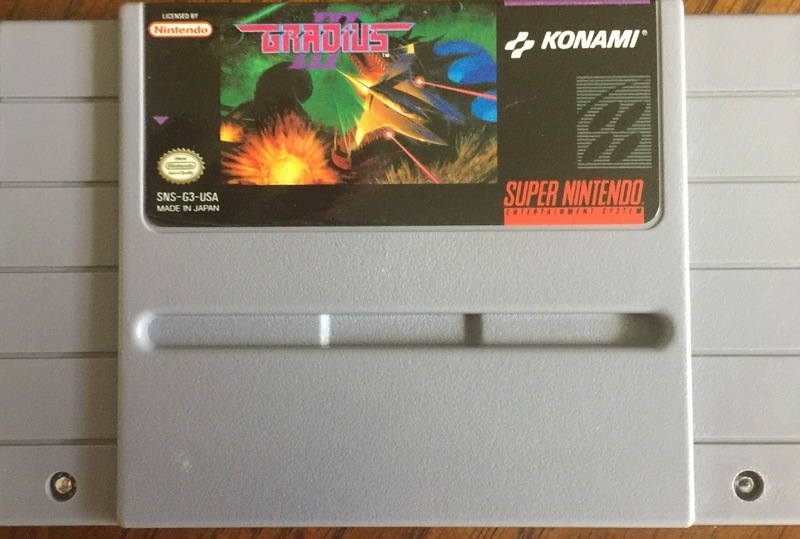 Gradius III (SNES) – Adding to my collection of SNES SHMUP’s this is another well noted entry. It was pretty entertaining and reminded me of R-Type in its layout. My biggest issue is that it moves slowly, and was prone to noticeable slow down when a lot of sprites were on screen. Overall, it’s a fairly good game but I feel it had a slip in quality compared to some of the other titles. 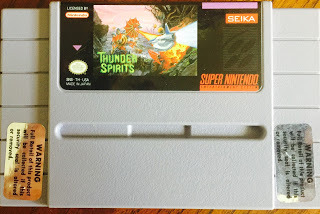 Thunder Spirits (SNES) – As mentioned last week this was the only Thunder Force entry on the SNES, being mainly a Sega Genesis franchise. This game is a little different than the average SHMUP, and I can see why the franchise has a cult following on the Genesis. Unlike a lot of other SHMUPs this one starts you out not in outer space, but side scrolling your way through a jungle. The concept works extremely well and creates the uncommon difficulty of your enemies being partially hidden by terrain, obviously not an issue in space. Compared to Gradius III which I just played, this game is well paced and there is no issue with slow down, despite the huge collection of enemies on screen and background scenery. Monster Party (NES) – With Halloween about a month a way this game seems a fitting buy for right about now. Basically this is a kiddie survival horror game about a boy transported to a strange world to help fend off evil monsters with his baseball bat. Yes, the main character does remind me a bit of Earthbound’s Nes, but this game came before that. Actually, the premise is somewhat creepy if you think about it, but if you take it for what it is, as a quick intro sequence trying to get to the point quickly you just kind of go with it. From what I understand of the history of this game is that it had added unlicensed characters initially and was forced to take them out later, as I also understand it the Famicom version still had some of these characters in. At least you still run across the man eating plant from Little Shop of Horrors, but he doesn’t say “Feed me Seymour!”. With all that said it’s a fun little game. Yes, weekends like these past two are part of the reason a backlog like I have has come into existence. 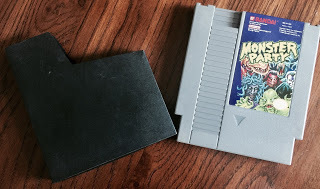 Anyway, following up on Monster Party I think I may put a Halloween article together closer to the “day” since I’m realizing now how many monster and ghost games I have built up over the last few years. Anyway, here’s to next weekend which I think may be three days, I have to check.